Hello! 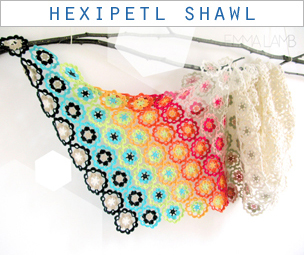 Oh, I am so thrilled about today's post as it is the first in a brand new column for 2013... yay! 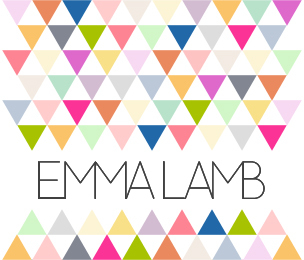 I've wanted to do a guest post series for such a long time now and last autumn I began pondering the idea of 'Colour Stories' where I would invite some lovely folk from our community to talk a wee bit about what colour means to them. Of everyone I have spoken to about it they have all responded with such wonderful enthusiasm for the idea. So with so much encouragement (thank you my friends!) I am at last getting this colourful feature underway... double yay! After an overly color-saturated and stimulating holiday season, white offers my weary senses a visual respite. Just like snow, nature’s own blanket and muffler, white is a resting place and covering. It provides a fresh start. 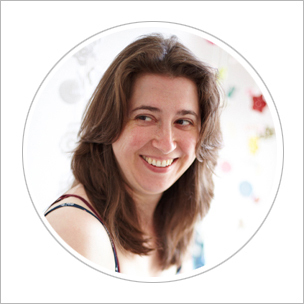 In fact, with colorful walls throughout my home, my office is the only room I painted white. These walls offer not only a calming effect, but a clean slate. White is where my ideas are born. So, when I decided to offer an annual White Issue of Gatherings Magazine (my quarterly digital lifestyle publication), it only seemed appropriate to launch at the New Year. This year, I coined the slogan for the White Issue, 'Start the New Year off White', meaning, invite white into your home, mind, heart and activities as a way to allow the creative juices to rest and recharge. 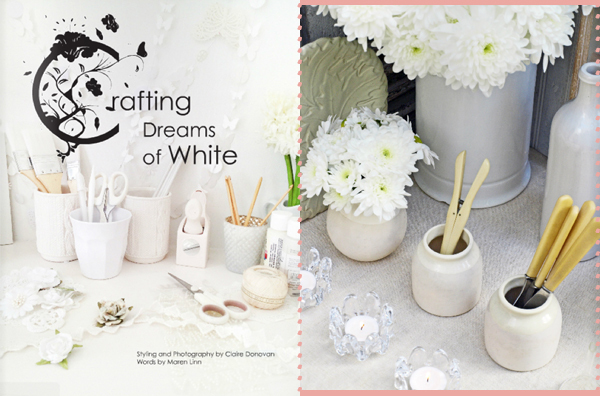 This second annual White Issue of Gatherings, provides inspiration to do just that. 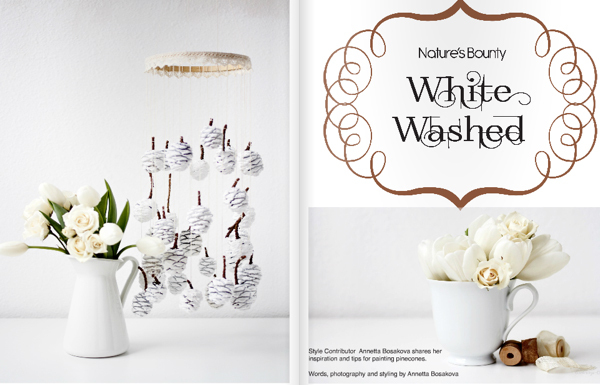 From craft projects in white, to an office makeover, and even recipes, my hope is that this White Issue becomes a blanket of calm after a season of over stimulation. White is my visual cue to inhale deeply and pause. And you? What does white offer you? For more info follow Gatherings on Facebook, Twitter and Pinterest! 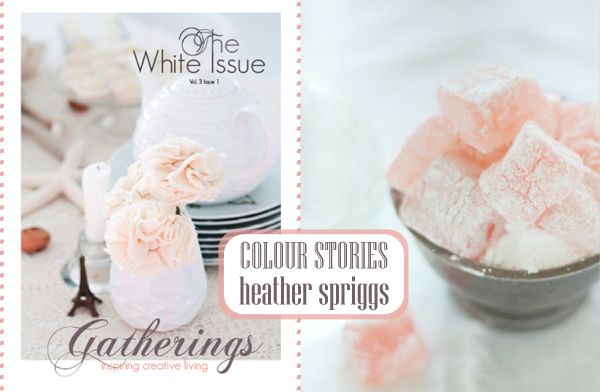 Thank you so much Heather, such a lovely insight into your inspiration for the White Issue of Gatherings Magazine... and this year's issue is bigger and better than ever, a must read if you haven't already! When it comes to white I think I am very much like Heather. It is a very calming yet refreshing. colour that always comes to mind in the New Year. A fresh start or a blank canvas. My brand new notebook for the year just waiting to be filled with all sorts of possibilities. For me it is also optimistic and full of creative potential! White may be the plainest of colours but to me in the right setting white can be utterly luxurious! teal is my fav colour..
You're right, white can sometimes feel plain and uninteresting but when you start to add beautiful light, subtle variations and interesting textures it is easy to create beauty... especially with interior decorating. I love your wish for white muslin curtains on a four poster bed... and can imagine it with slightly crumpled white linen sheets and a vintage morrocan wedding blanket. Luxury indeed! I just finished "The White Issue". What a grand magazine ! I found myself wanting a soothing white room ! I enjoyed every drop of it ! I too am a big fan of white. I love to buy old tables, chairs, baskets etc. with interesting shapes then paint them all white. A white lace table runner on top with a fuchsia coloured piece of glass on top of that and I'm in heaven visually speaking! Lind, I too love old furniture peices reworked in white... it is such a great way to highlight their shape, form and texture as you said. 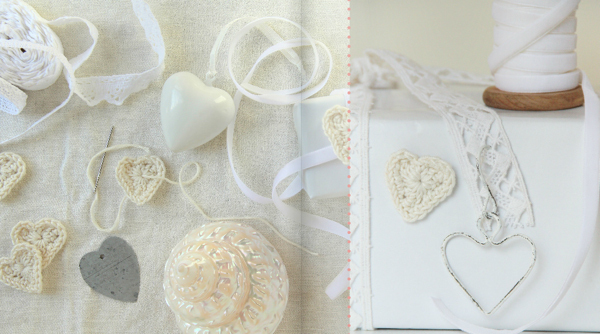 Your vision of white lace with fuchsia sounds inspiring, have you created that already? Hi Emma, I've converted a brown cane dressing table by painting it white (of course) after chopping about 6 inches off the legs. It's now a sewing desk. I have a lovely large round fuchsia glass paperweight, you know the kind with air bubbles in them and I'm just scouring the charity shops for a piece of vintage lace to put on the table with the p'weight. As they say 2 out of 3 ain't bad. When I get a piece I'll photograph it and send you the link.